Return of the Living Dead 2’s whole chain of events starts when another one of those dreaded pesky barrels of Trioxin rolls off the back of an army truck on its way to the fort for disposal. Inside the barrel, is housed one of the 'living dead' and a whole mess of the toxic gas that is known to bring the dead back to life in search of tasty brains. Not normally a big problem, army would come back and find it along the route at some point that is until two pesky kids decide they are going to mess around and open it. Releasing the gas, and starting a lot of trouble for a lot of people; them-self included; when the gas makes them both deathly ill. When the call to the military fails due to the lines being taken out; the only thing that the living can do, is try to make it across the bridge to the military and hope that they can sort it all out. 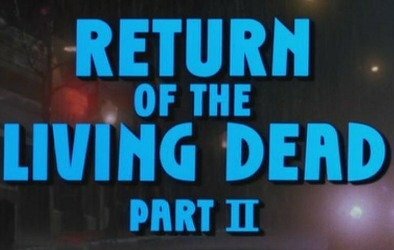 This sequel to the popular cult hit Return of the Living Dead, Return of the Living Dead 2 does not disappoint. It will deliver everything you expect from the franchise in spades. A dark comedy, some puns at its own expense, hot girls jumping around in spandex, and of course...lots of zombies in pursuit of tasty brains. 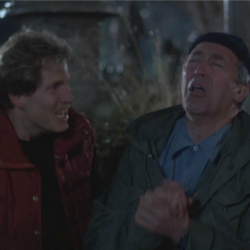 Some of the actors you will remember from Return of the Living Dead, James Karen returns, and this time as bumbling grave robber Ed, instead of bumbling supply house worker Frank. Thom Mathews returns to re-play the boyfriend-turned zombie that he played in the first one, just a different name this time (Joey instead of Freddy). Jonathan Terry returns as Colonel Glover, and Allan Trautman reprises his role of Tarman. In fact one of my favorite lines in the movie comes from Joey on the topic: "Man, this is all a bad dream, we have done this before. Me, You, Him..." As he points to all the actors that were in the first movie with him. 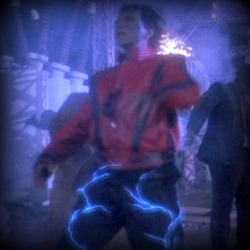 Special effects are a bit better than the first one, though sadly some of the lines are not. The jokes just get 'worse' and 'worse' through the whole movie, but that is part of what makes them better and better. Some zombie movies try too hard to be scary and end up making them-self just a bad movie over all. Not scary, not funny, just trying too hard; not so with Return of the Living Dead 2. It knows it isn't a great movie; and runs with it; it runs hard, fast, and makes it to the finish line and only stumbles once or twice getting a quick recovery each time. So much more could have been done with a couple of the plot twists, but doing so would have made the movie hit the two hour mark and that would probably be a bit too much for most people. You can Buy Return of the Living Dead 2 on DVD or you can get it as a Direct Download on Amazon for 9.99 or 1.99 for a 48 hour Rental .